Back in May, my “Odds and Ends blog entry” was lead off with the news that ESPN had decided to drop their coverage of the AMA Supercross series. 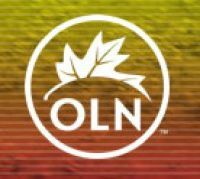 OLN was quick to pick up the TV contract for the 2005 Motocross series but it was unclear about whether they would also be showing this coming Supercross season. Well, now the answer is clear as SpeedTV today announced that they have signed a five year contract to televise the AMA Supercross races. With Supercross popularity continuing to rise, thanks mainly tothe personalities of riders like Ricky Carmichael and Bubba Stewart, it is fantastic to see such a commitment from Speed. It is also interesting to see that the AMA is now marketing the television rights to the Motocross and Supercross series separately. This highlights the issue recently mentioned on Motorcycle Daily about how Supercross as far outstripped Motocross in prestige. This is further illustrated by the recent press releases explaining how riders like Chad Reed and Bubba Stewart are skipping motocross races in order to be ready for the upcoming Supercross season or the news that factory star David Vuillemin has signed a Supercross only contract with Team BooKoo for the 2006 season. Now it really isn’t all that surprising that Speed would be interested in picking up the TV rights for Supercross. First of all, they have been airing the thirteen episode TV show “The Reality of Speed” which chronicles the lives of the five riders on the Samsung Wireless Sprint team throughout the 2005 Supercross season. Good stuff and a much better use of their air time than some of their other crap like Texas Hardtails and NASCAR Nation. Speed has also been watching as viewer ratings for their motorcycle coverage of MotoGP have risen this summer. It is hard to quantify exactly what their stats are but it does appear that the numbers for MotoGP are equal to, if not higher than, some of their bread-n-butter car racing programming. While the NASCAR-centric programming directors may not be interested in motorcycle racing I’m sure the accountants are quickly becoming big fans. Speed already has the rights to MotoGP (and its support classes of 125GP and 250GP), World Superbike (and World Supersport), AMA Superbike (Supersport, Superstock and Formula Xtreme), AMA Arenacross, FIM Motocross and FIM Enduro. Quite an impressive line-up of two wheeled racing (’course, they have also reduced Two Wheeled Tuesday to a half-hour, added Biker Build Off and the aforementioned Texas Hardtails so things are all wine and roses). Oh well, at least what was once on the way to becoming NASCAR-TV is now becoming Motorcycle-TV. That’s a change I can deal with! As I mentioned in my my Odds and Ends posting for the month of May the much anticipated show down between the “Big Four” (Carmichael, Stewart, Reed and Windham) that never really materialized in the Supercross season was delayed until the Motocross season. Well, with that season nearly over, it seems that the news is just a re-run of the SX story: Ricky Carmichael is truly the best there is. Chad Reed struggled (he’s a better SX than MX rider anyway) and Kevin Windham couldn’t quite make the leap necessary to run with RC. But the big news, just like in SX, has been Bubba Stewart. Unfortunately that news is also the same as was told last winter. Stewart is amazingly talented and very fast but crashes have ruined his season. In fact, Stewart ended his Supercross season early because of a crash and then picked back up in the Motocross series with two crashes in the first moto at Hangtown. He then pulled out of the second moto (depending on who you believe the reason for the early retirement being either crash related injuries, dizziness from the heat or being tired from lack of physical conditioning.) A 12th overall finish due to 6-30 finishes was a less spectacular splash that everyone was expecting from the rising star diving into his rookie year in the 250 class. Sadly, the following seven rounds haven’t really been much better for the Kawasaki rider. Another crash at Mt. Morris while still managing 2-2 finishes. The mystery that is Bubba grew even bigger at Southwick where he pulled out of the first moto feeling light-headed and failed to start the second. Was this a health problem? A bike problem? A political battle with Kawasaki? Lots of questions but no answers. Budds Creek offered another chapter to the saga with Stewart bouncing back to card 2-3 moto finishes for third overall. He also had a coming together with RC in practice that kept the rumor mills churning. This was mirrored at Redbud where he again got 2-3 results but this time had a run-in with Windham in the second moto. This mid-season string of podium finishes looked good but the streak came to an end at Unadilla where JBS made a mistake over a jump while dicing for the lead and landed on Carmichael. He was carted off with a possible head injury and thus missed the second moto. This injury kept him out of the following races at Thunder Valley and Washougal as well, though strangely enough he was rumored to have ridden and crashed while practicing pre-race at Thunder Valley. His return was scheduled to be this past weekend at Spring Creek but a pre-race practice crash at Glen Helen put him yet again on the injured list. As of round 9 of the 12 race series, he has some pretty interesting statistics in his rookie 250 MX season: 6 podiums (four seconds, two thirds) in seven race finishes (the aforementioned podiums plus the 6th in the first moto at Hangtown). He either pulled out or crashed out of three motos and then didn’t start eight motos. Finally, he had fairly high profile run-ins with both Carmichael and Windham though none of them appear to be clear-cut cases of dirty riding. Going into next week’s race at Broome-Tioga, Stewart currently sits eleventh in points a staggering 326 points behind championship leader Ricky Carmichael. What’s it all mean? Well, there is no doubt that Bubba has been at a great disadvantage all season long to be riding the Kawasaki KX250 two-stroke against the big four strokes that all his competitors are running. It is worth noting that his teammate, the hard riding Michael Byrne, is also riding the KX and his best finish of the season is fifth. (Bryne finished fifth in the second moto at Washougal and his best overall finish has been sixth, which he did on three occasions: Hangtown, Unadilla and Washougal). Stewart’s six podium finishes look good in comparison. Less flattering for Bubba is the fact that Bryne’s consistent riding have him eighth in the title fight versus Bubba’s eleventh. 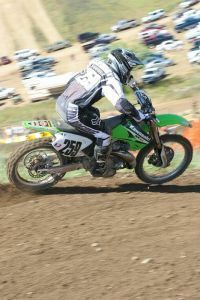 Staying on the bike clearly pays dividends given the AMA points structure. This is really the crux of the matter. Why is Bubba crashing so much. The theories are numerous: First, that he’s just a “win it or bin it” type rider. This line of reasoning would certainly seem to have been validated based on the recent Supercross season. Bubba was clearly the fastest rider every time he was on the bike and after Orlando seemed to acknowledge that he could afford to slow down and still win. (Then again, he crashed two races later at the Silverdome while leading, handing the win to Reed). Regardless of how fast he is, he finished his inaugural Supercross season in tenth place, 238 points behind eventual winner Carmichael and appears to be doing the same in Motocross. 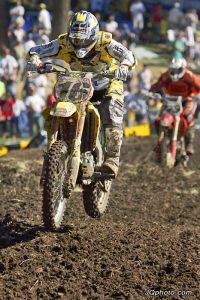 Another idea is that Stewart doesn’t have the physical endurance to run the more strenuous motocross races, especially with a two moto format, and is just tiring out. I don’t know what Stewart’s physical conditioning routine is but it is obvious that Ricky Carmichael has set the bar pretty high in this regard over the past few seasons. I doubt anyone trains harder than RC. Since most of Stewart’s crashes have occurred in the first moto, and often early in the first moto, there really isn’t enough data to draw any conclusion on this. However, to beat RC straight up will require a rider of incredible stamina…only time will tell if Stewart is training to this level or not. For another angle, one can always consider the “injury begets injury” idea. 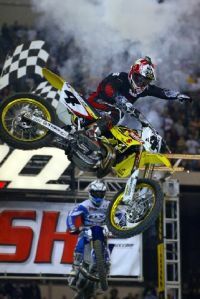 Stewart started the season with an injured thumb after a practice crash at the Supercross final in Vegas. He then had two crashes at Hangtown followed by another at round two at Mt. Morris. Not the best way to start the season. It is quite possible…perhaps even likely…that the Hangtown crashes were caused by the injured thumb. Perhaps the Morris crash was caused by lingering effects of getting slammed at Hangtown. These could then have cascaded throughout the season. If so, Kawasaki may be wise to scratch the rest of the MX season and focus on having a healthy rider for the first race on the ‘06 Supercross calendar. Then again, avoiding (or coping with) injury is part of the playing field. Carmichael, Reed and Windham have all had crashes this year but have won despite them. Its a theory but its not an excuse. Finally, there is always the bike question: As if there isn’t enough mystery in the Team Green camp these days the question of when the new 450 four stroke will debut has still not been answered. At the beginning of the season it seemed a sure thing that it would break cover before the end of the season but time is quickly running out. If Bubba is having to over-ride the KX then there are only a few options. One, see if someone can get into the kid’s head and explain that a top 10 finish on an inferior bike is better than consistently crashing out while trying to run up front. Two, keep him off the bike until the four stroke is ready for prime-time. Three, release the four stroke early and take the lumps that come with developing a new race bike squarely in the public eye. Even if the new bike causes crashes while its being developed, its no different that what’s already happening on the two-smoke. Perhaps only seeing Stewart ride the 450 will truly answer the question of whether he can run with RC or not. It is also the only way to tell if the incredibily talented James “Bubba” Stewart’s entire career will be defined by the all-or-nothing “win it or bin it” philosophy or if, like Carmichael in the ’90s, Stewart can mature beyond that to become a dominant force in both Supercross and Motocross.